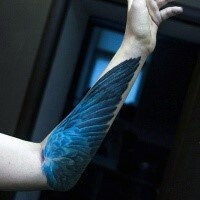 Wing tattoo is considered the symbol of angels and symbolize the divine beauty and innocence. 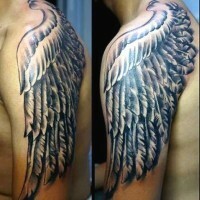 Angel wing tattoos also symbolize spirit and also wing tattoo designs may not have any relevance to the religion. 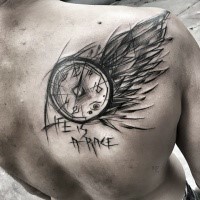 Wing tattoos can be associated with the flight, with longing to freedom. Angel wings can symbolize protection, might, generosity, purity, love and wit. In Ancient Egypt the pictures of wings were the symbol of might and glory. 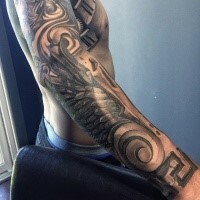 Wing tattoos can be often seen with the initials of relatives, for example if on tattoo is the name or initials of dead close relative, then such tattoo points to the fact that this relative is among angels or is personal guardian. 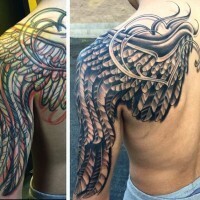 In wing tattoo designs different colors can be used, and it will bring the tattoo more beauty and individuality. 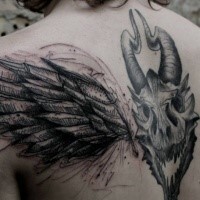 Also wing tattoos symbolize speed, movement, superiority, freedom, intelligence and spirit. 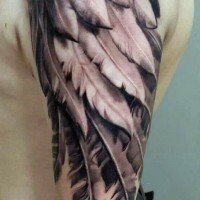 Almost everyone connect wing tattoos with angels because see some divine beauty, purity and innocence in them. That’s why lately they become more popular among people. 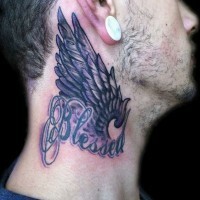 Many people think wing tattoos to symbolize something spiritual and pure. For some extent it is correct. But wing tattoos can have another meanings too. 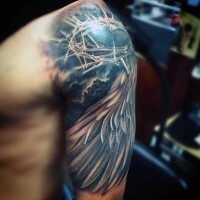 Some people make a mistake when they think that every wing tattoo design is closely connected with religion. It is not right for sure. Just think that every person includes his own meaning in each tattoo that only he can understand. 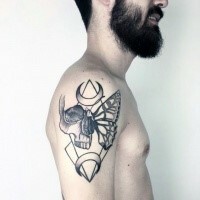 Sometimes such tattoos are applied in one color (white), but nowadays often there are other colors. Sometimes clients insist the color of the wings to be not white, but, for example, black. 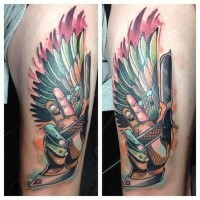 But mind, that this exact variant is considered not suitable for wing tattoos. Black wings may become the symbol of danger, because most of the times they symbolize fallen angels. 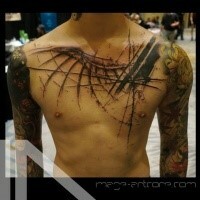 Such tattoo for sure won’t bring anything good to those who will wear it on body. 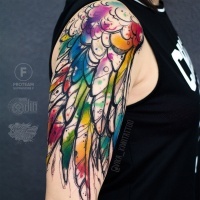 In the process of choice of design for wing tattoo and also its color in particular you should mind that the color often reveals your soul and your character. 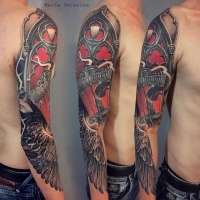 Wing tattoos are extremely popular and unique because they can be made in lots of different forms and can suit well both to women and men. 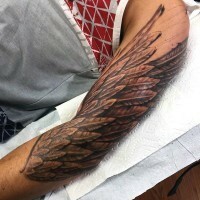 One of the greatest meanings of wing tattoo designs is that they usually bring protection. They bear great holy meaning because they represent the wings of angel. 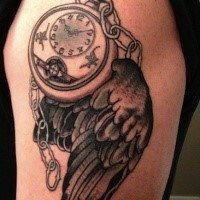 Another popular meaning of wing tattoo is that it symbolizes freedom. It is very evident, because wing can bring you practically everything. People who choose to apply wing tattoos always know that they are responsible for their own freedom, and it does not matter where they are situated. 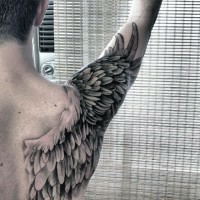 Wing tattoos can be depicted as angel wings or even as bird wings. 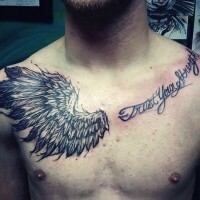 It depends on the fact what type of tattoo was chosen and what the person wanted the wing tattoo to mean. 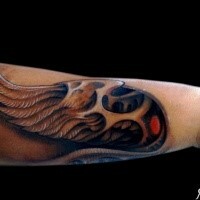 For some people wing tattoo can symbolize both protection and freedom. So people have the right to do what they want because they are protected at that time. 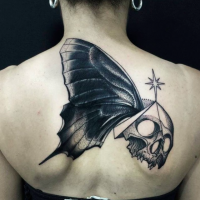 Another popular wing tattoo design represents butterfly wings. They usually are applied by women. 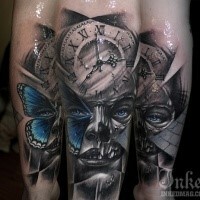 Most of all such tattoo means famine. Also there is more deep meaning in such a tattoo. It has sacral meaning because wings always represented human soul. For people who find the meaning in such a tattoo it can mean much more, than others can think. Wing tattoos also can represent weakness of the human life, because everything good can be destroyed physically and mentally. Butterfly wing tattoo can also represent human life cycle because all butterflies have different periods of life. So they represent the changes and transformations that happen in human life.